For most people that arrive in Jamaica, their first destination is usually always the beach. Once there, surrounded by the beauty of the coastline and crystal clear blue Caribbean Sea, it’s very easy to slip into the laid back Jamaican relaxation mood and forget about anything else. Just remember, Jamaica is an island of variety and there is much to see and do. Most travelers to Jamaica come for an enjoyable relaxing vacation and usually stay in one of the many wonderful resort towns on the island. Jamaica’s top three resort destinations are Negril, Montego Bay and Ocho Rios. You can’t go wrong at any of these top choices as each town has it’s own distinct personality. Get out, go explore the island and plan a memorable adventure! Finding something to do at any of the top resort towns in Jamaica is no problem! The famous 7-mile white sandy beach of Negril. Negril is famous for its party atmosphere and younger hedonistic crowds that head to the famous 7-mile beach, a beautiful slice of paradise with white sandy beaches that line the West coast of the island. 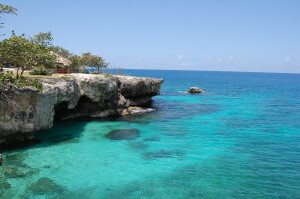 At the end it turns into the famous Negril West End cliffs where the rocky edges rise as high as 40 feet from the ocean. Along this whole strip you will find a wide variety of accommodations, with countless all-inclusive resorts, hotels, villas, cottages and apartments, mixed in among the many bars, restaurants, shops, attractions and other businesses catering to the many tourists and vacationers that come to visit Negril. You can find all sorts of water sport activities along the Negril beach. 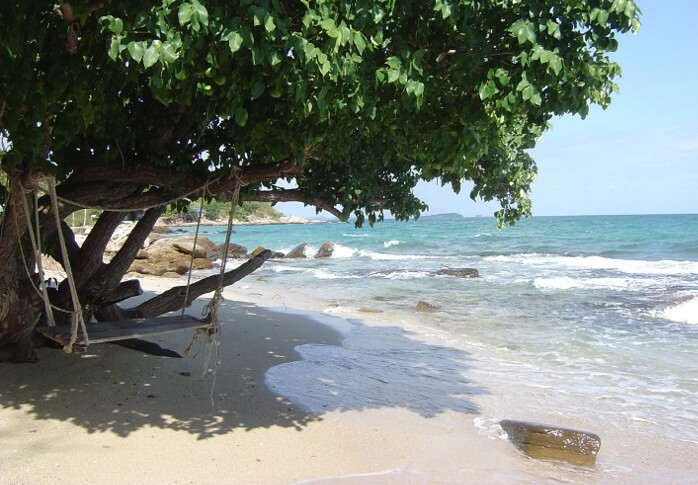 Just taking a casual walk along the beach, you’ll find a variety of establishments encouraging you to try jet ski’s, snorkeling, para-sailing, windsurfing, glass bottom boat tours, scuba diving and much more. Businesses line this beach and your options are pretty much available anywhere along the 7-mile stretch. The West End Cliffs of Negril. The sea is usually calm along the beach area, but it does get somewhat rougher towards the cliffs. You can go snorkeling in one of the many caves and coves dotted along the West End cliffs of Negril. My advice is to go in the morning as the seas are calmer in the early parts of the day. Glass bottom boat rides are very popular here as well as along the shallow reefs just off the coast of Negril. Scuba diving in Negril is hugely popular with all of the resorts having daily scheduled dives at the most popular dive sites off the coast. You’ll see many visitors, staying in other areas of the island, heading to Negril during the day to relax on the beach and just lounge at the many bars and restaurants along the strip. As the day winds down, you’ll see busload after busload of tourists heading down the West End road to the World Famous Rick’s Cafe to catch the best sunset on the island and watch the famous cliff divers. See why Rick’s Cafe is so popular here. 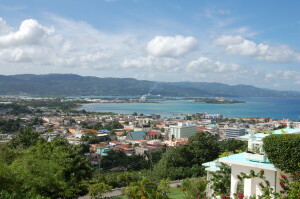 Montego Bay is the 2nd largest city in Jamaica. The second largest city on the island after Kingston, Montego Bay was crowned the ‘Leading Beach Destination in the World’ at the World Travel Awards in 2010. It’s a popular Caribbean cruise ship port and home of Sangster International Airport, where many visitors arrive and depart from each day. The cruise ships bring daily visitors to the island to sample its rich culture and exotic beauty in a day stop. Just like Negril, there is a variety of accommodations and plenty of things to do, as well as many gorgeous beaches to just relax at, if that’s all you want to do. Some very popular activities and day tours include rafting down Jamaica’s winding rivers on long bamboo rafts, scuba diving or touring the Montego Bay Marine Park to catch a glimpse of the undersea marine life, partying at Margaritaville or shopping and sightseeing around the city of Montego Bay. Negril is just West of Montego Bay, about an hour away, while Ocho Rios is East of Montego Bay, a little over an hour by car. In between Montego Bay and Ocho Rios lies Falmouth, Jamaica. The town of Falmouth is also now a popular cruise ship port on the island and home to Glistening Waters Luminous Lagoon. Be sure to plan a tour at this awesome island attraction. It is something you don’t want to miss! Read more about Glistening Waters and why this place is so special here. Dunn’s River Falls in Ocho Rios, Jamaica. Ocho Rios is located on the North coast of the island and home to one of the most popular cruise ports in all of the Caribbean. With docking facilities for up to 3 vessels at a time in the beautiful crescent-shaped bay, this town can get packed with tourists and visitors on certain days. 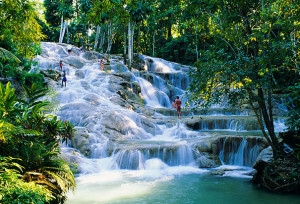 The most famous attraction in Jamaica without any doubt is Dunn’s River Falls. A clean, cool river that naturally cascades 600 feet down to the sea below. It is located just West of Ocho Rios, near Dolphin Cove and attracts many hundred people a day that climb up the waterfalls to the top through the cascading rocks. Climbing up the waterfall at Dunn’s River Falls is a must-do activity while in Ocho Rios. There is plenty for visitors to see and do in Ocho Rios. For fans of the reggae superstar, Bob Marley, you can take a day tour to Nine Mile to see his birth place and pay your respects to the legend, who was undoubtedly one of the World’s most famous Reggae musicians. Others may venture out to see Fern Gully, or Shaw Park Gardens, or Goldeneye where Ian Fleming penned his famous James Bond novels. Noel Coward’s hilltop home is also open to visitors of Jamaica and many exclaim that the view from his home is one of the best on the island. Ocho Rios offers a huge craft market, many shopping centers, the popular Island Village, and many restaurants, shops, nightclubs and bars. And other popular activities like swimming with dolphins, scuba diving, horseback riding in the sea, zip-line wire canopy tours, river tubing and kayaking are just some of what’s on offer in and around this action-packed resort town. Being hugely popular with travelers and having so much to offer, it’s no surprise that Jamaica also won the World Travel Awards 2010 Leading Caribbean Destination. And The Lonely Planet first travel awards also crowned Jamaica as the Best Cultural Experience in the World. Come see for yourself what makes Jamaica so special. This entry was posted in Entertainment, Falmouth, Montego Bay, Negril, Ocho Rios, Scuba Diving, Things To Do, Travel. Bookmark the permalink.